What Even Is Polishing To Begin With? First things first, what does it mean to polish? To me it means one thing: polishing a knife is refining its edge to make it wickedly sharp, thereby giving it a clean mirror finish. Some people also think of it as removal of nicks and imperfections. Either way, the goal is to end up with as sharp an edge as possible. In fact this has always been the goal of knife sharpening. An interesting truth I discovered while sharpening, is that polishing an edge can make all the difference between having a knife of average sharpness, to one that is blazing sharp. You can use coarse stones all you want, but it’s the extra fine stones that really give you the finished product you so desire. Now, keep in mind everyone will have his/her own style on how to polish a knife edge, so what one does, another may not follow exactly. Alright let’s get into it! A Properly Polished Knife Can Be The Difference Between Wickedly Sharp To Just Average! But You’re Gonna Need A Couple of Things! If you want to learn how to polish a knife the right way, you’re going to have to invest in some decent stones and a leather strop. If you own an electric or pull through knife sharpener, I am sorry that’s not going to cut it. And that’s because polishing an edge is a skill that can only be achieved by freehand sharpening, as this affords you 100% control. Let’s discuss stones for a second, shall we? To achieve a mirror finish, you need a stone that is extra fine, or in other words a stone with an extremely high grit value. 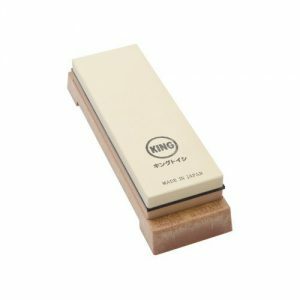 A friend of mine was telling me he has a 10,000 grit Japanese water stone to polish his edge, and he would like to upgrade to a 15,000. To be honest, I’ve never had to go quite high myself, and I’ve found that usually a 1000 grit diamond stone will suffice for what I require. Having said that, I would suggest you either get a Japanese water stone or a diamond stone. Both should work fine. Some enthusiasts will tell you to only use Japanese water stones, and others will swear to use nothing but diamond. I am of the opinion that both are fantastic options provided you know how to polish a knife properly. We’ll talk about technique a little later, but for now what’s important is that you understand the importance of high grit, extra fine stones for the purpose of polishing an edge. One more thing I want to mention before moving on is the importance of stone quality. Stone quality is paramount, and you should always strive to buy and use high quality stones. Yes it costs more, but when you see the results you’ll know why! Stay away from knock off Chinese stones. They will deteriorate and break apart easily and most don’t have a completely flat surface. Not sure what to get, don’t worry I got you covered! Below are some recommendations for high quality polishing stones. This first recommendation is for anyone looking to sharpen and polish a knife using diamond. Diamond is an incredibly hard abrasive and therefore has the capability of removing the most steel with only a few passes. If used correctly, diamond stones can be highly effective. When talking about quality diamond stones, one name quickly comes to mind: DMT. DMT have long been the experts in producing high quality, affordable diamond sharpening solutions. There are a number of products they offer, so it can be easy to get confused. 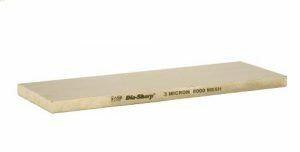 When talking about how to polish a knife, there’s one stone that trumps the rest: 8 inch dia-sharp extra extra fine bench stone. This Extra Extra Fine Bench Stone Is Perfect For Polishing! This 8×3 inch stone is large enough to work on knives and tools of all sizes, and it’s uninterrupted continuous surface is especially great when it comes to polishing. The extra extra fine grit will put a polish on just about anything you can think of! A little expensive (click here to check out latest pricing on amazon), but it’s well worth the investment, as this will probably be the last polishing stone you’ll ever need. There are literally tons of different Japanese water stones to choose from. 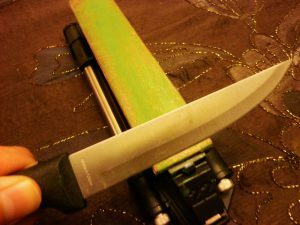 If you have some knowledge about knife sharpening, you’ll know that every enthusiast has his/her own brand that they will swear by. Generally speaking, the higher the quality of the stone, the more it will cost. But that doesn’t mean you can’t find a cheap, quality stone that will do the job. The combination stone offered by KING is such an example. This 2 Sided Combination Stone From KING Is Reasonable & Does The Job! What’s neat about this particular stone is that it comes in two different grits: 1000 to work on dull blades, and 6000 to put a clean polish. It also comes with a base to place the stone on when sharpening. Overall, I love water stones but they do take a bit more work to prepare and use. What do I mean by this? Water stones need to be soaked in water for some time before you can use them, and unlike diamond, these stones will disintegrate and become uneven after multiple uses. Because of this, they need to be flattened (by a harder material) typically before every use. The upside is they’re generally cheaper than diamond, and you have a larger variety of grits to choose from. How To Polish A Knife: Technique & Actually Doing It! Okay, so up to this point we have talked about what polishing is, and what stones you require to get a mirror finish. I’ve provided you with what I think are two very solid recommendations that can polish a knife edge if done properly. This is the part where we discuss how to polish a knife. Below are 3 important things you need to know and understand. If you know how to sharpen a knife using stone, then that’s exactly how to polish a knife also. The only difference is the abrasive you use. For sharpening or putting an edge, you’re likely to use a coarse stone and one that removes a lot of steel. And for polishing as mentioned throughout this post, you’d use a fine stone. Remember, the goal is to refine the edge by getting rid of any excess steel. Now you may be wondering at this point, is that really all there is to it? And the answer is yes. The truth is most people make the matter more complicated than it really is. So all you need to know is how to sharpen freehand on stone, and you’re golden! Comprender? In the last post I wrote about diamond stones, there is an entire section dedicated on how to sharpen. Click here to check out the post. It’s imperative you carefully read and understand the steps outlined. 2. Don’t Forget To Strop! Once you’re done polishing on an extra extra fine stone, the next step is to strop your edge. Stropping further refines and polishes an edge, thereby making it more sharper. Not sure how to strop? Here’s an instructable I wrote that illustrates exactly how to do this. Read it, understand it, and apply it! When I initially began learning how to polish a knife on stone, I used a cheap, crappy $5 Walmart kitchen blade. I was curious to see how sharp I could get it to be, so off I went! There’s something important here that you should understand. You should never ever sharpen an expensive knife freehand on stone, if you’re unsure! Go do yourself a favor, head to Walmart and buy a $5 throw away to practice on. Another thing, don’t waste your time watching tons of YouTube videos about how to sharpen on stone. Watch only one video and watch it 10 times! I personally suggest you watch Bob Kramer, as this is someone who knows his stuff. 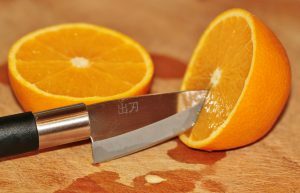 You can watch and learn as much as you want, but you need to take action and try sharpening a knife by yourself. Make mistakes, learn from them and improve your technique. It won’t take too long before you can really put a wicked edge on a blade, trust me I know this from experience! If you did, I’d love to hear what your results were. If this post helped you, a share would be appreciated! Any other ideas on how to polish a knife? Let me know by leaving me a comment. Thanks for checking out myelectricknifesharpener and until next time!